Do you ever feel as if you’re trapped within your life, constrained by circumstances and unable to achieve the true freedom that you desire? Do you sometimes feel overwhelmed, trying to muster up options you could take, only to assess none of them are practical and there is simply nothing rational that you can do to change where you’re at? Maybe you have ideas you’d like to pursue but a door has been slammed in your face, or maybe a significant event has happened that’s left you in turmoil. If a situation is out of our control, we may rationally comprehend there is no point in worrying about it, there is nothing you can do except accept it and carry on, however, this is often easier said than done often when you yearn for a change of some kind to happen. Whilst silencing your mind and accepting the situation may seem like the logical thing to do, our minds are vast playgrounds of thoughts, where we can have fun in our imagination, or we can turn on ourselves and tear apart the intricacies of our life. Always chatting, always whirring, always there with the checklist ready to mark out what is and isn’t going well – the mind will always have something to say if you allow it to speak and are willing to listen. As followers of the Celestine Vision, many of us spend our days watching for synchronicities, waiting for the next special moment which will move us further on in our journey, however when things halt and you feel boxed in, we must not fear that synchronicity has stopped working. When you feel there is nothing you can do, consider that this situation is more like an enforced Time Out given to us by the universe. We can be so busy in our lives, we must remember that if we start heading in a less preferable direction, the universe may push you to a position where the ability to navigate is taken out of your hands. During these periods, remember another door will open – it may be that currently you’re focusing your attention in the wrong direction so you can’t see the wood for trees, and with a little time to reflect, and maybe a little more knowledge gained, you will find a progression that truly pleases your soul and your community. This enforced period of nothingness, where your limbs appear tied, can be uncomfortable, maybe you’ve actually fallen ill and your body is restricting what you can do – whether your restraints are physical or metaphorical, we must consider that this period is happening for a reason and one day, when the universe is ready to unfold, your solution will appear. 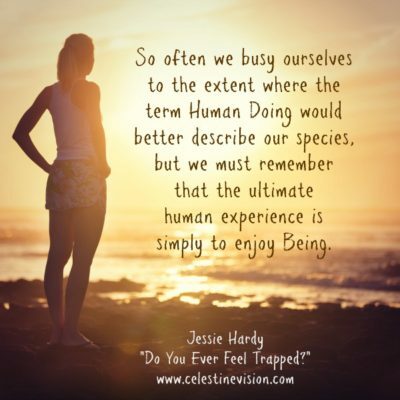 So often we busy ourselves to the extent where the term Human Doing would better describe our species, but we must remember that the ultimate human experience is simply to enjoy Being. Yes, there are many things we would like to do, places we’d like to go and people we’d like to meet, but if the universe doesn’t feel like letting you do those things at the moment, try telling your mind to take some time off, and try your best to simply enjoy being exactly where you are. If you find it impossible to enjoy your surroundings, try to consider what you have in your life right now that you are grateful for. Consider you are grateful for your heart which is beating in your chest and its capacity to love, consider that you’re grateful for the roof over your head, the food in your cupboard, and the souls in your life who you care for. Counting your blessings during turbulent times will be your first route to giving your mind something positive to focus on. If you consider that things could be worse, and try to at least switch off from worrying ‘Just for today’, you can take life one day at a day, remaining positive and trying to centre yourself on the notion that what will be will be. If we live our lives doing the very best we can each day, we can have faith that we will be guided in a positive direction towards finding that silver lining. One thing we can rely on is Change – nothing in our world is ever constant, nor ever remains the same. So, whilst you may feel trapped now, take peace in the knowledge that circumstances evolve naturally, sometimes there are things you can do to move things forward and sometimes there aren’t, but either way change will come. To be kept updated with Celestine news and initiatives, subscribe to our newsletter here.